Fish tales start here! Home to the Pilbara’s fishiest waters, many a fishing legend will happily recount the number of times they reeled in a thumping great Red Emperor, GT or Sailfish. The Mackerel Islands are the one fishing spot you can tell everyone about – there’s plenty to go around! Whatever your fishing style, beach fishing, boat fishing, or fly fishing, you’ll find all the action right here. One of the best ways to experience the species-rich waters surrounding the Mackerel Islands is by fishing charter. Our experienced skipper can take you to our favourite fishing spots such as the famous Rosily Cay, or let you in on some of our secret snorkelling bays, home to an abundance of fish life and crayfish. A bucket list adventure! With over 40 year’s experience fishing these waters, we are the region’s experts and our fishing charters are pretty extraordinary. Operating from Island Escape, a new, custom built 11 metre LeisureCat, powered by Yamaha for a fast and comfortable ride, with room to fish and top quality gear supplied. We take up to 10 people, giving you a personal and specialised fishing experience on these amazing waters like you’ve never had before. 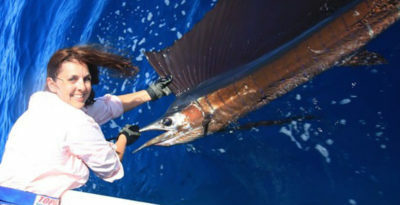 Game fishing, sportfishing, bottom fishing, trolling, for red emperor, coral trout, spanish mackerel, sailfish, rankin cod, yellowfin tuna, giant trevally, queenfish, ruby snapper, mahi mahi and more. Prices for 2019 out now, click for details! 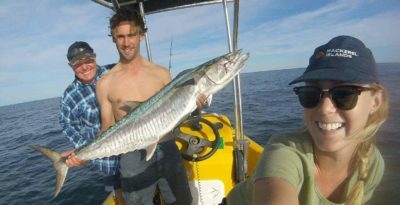 Surrounded by coral reefs, the Mackerel Islands are situated amongst some of the best fishing grounds in Australia. With your boat conveniently moored at the islands, getting to these fishing havens is only a matter of minutes, which means less time travelling out, more time fishing! Feel the stresses of everyday life melt away when you try your hand at some relaxing beach fishing. 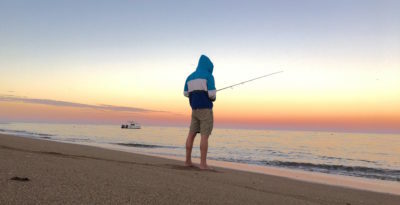 Beautiful quiet beaches with deep channels, reefs and sand flats surround the Mackerel Islands, so your own secluded fishing spot is never far away and just waiting to be discovered. Very few places in Australia can produce the amount of saltwater action enjoyed at the Mackerel Islands, and fly fishing is no exception. We’ve hosted individuals as well as groups of up to 30 people, producing upward of 70 species of fish in a week, including mega class fish. Truly a fly fisher’s dream.